Even in Australian terms, Broken Hill – 850 kilometres north of Melbourne, 1150 kilometres west of Sydney – feels a long way from anywhere. Yet in its boom days, the sweltering main street boasted more hotels than any city in Australia. From the ironwork verandah of the Palace Hotel, I look out at the gigantic slag heap that dominates every street like a frown. Grey and obdurate, “the mullock” is an unavoidable reminder of the source of Broken Hill’s phenomenal wealth in the early 20th century, when its minerals – chiefly zinc, silver and lead – were railroaded to Port Pirie and then shipped to Saxon smelters in Freiberg, “the Mecca of ores”, to make, among other things, bullets for German guns. It was on a roasting morning like this, topping 30 degrees, that the NSW town witnessed the only enemy action of World War One on Australian soil. The story is hardly known anywhere – and little enough in Broken Hill – yet it leads like a lightning rod into a conflagration that burns today with still greater ferocity, from Boston to Endeavour Hills, and from Abu Bakr al-Baghdadi’s self-proclaimed Islamic State caliphate to Mecca itself. History in Australia lies close to the surface, but its nuggets are easy to overlook, especially in the heat-struck interior. I hope the tale I’m prospecting won’t prove as elusive as the town’s Railway & Historical Museum. Stepping into the sunlight on Argent Street, I ask directions from a man leaving a betting shop. Cheerfully, he says that the museum is in the next street, just round the corner. I go round the corner. Nothing. I walk over to another man, who points with confidence back down Bromide Street. I follow his finger. But no museum. Eventually, I find it in Blende Street. Tucked out of sight on a shelf in what used to be the stationmaster’s office, a plastic black binder contains detailed accounts, reports and photographs of what became known locally as “The New Year’s Day Tragedy”. The tragedy was a desperate response, in the least likely spot, to a jihad announced on the other side of the world. On 11 November 1914 – 100 years ago this month – the Ottoman Sultan Mehmed V, and caliph of all Muslims, who had earlier signed a treaty with Germany, declared a holy war against Great Britain and her allies, “the mortal enemies of Islam”. The Turkish sultan’s call overlooked the Christianity of his own allies in Germany and Austria-Hungary, and was virtually ignored by Muslims, save for some small-scale mutinies in Egypt and Mesopotamia, and in Broken Hill where two disaffected “Turks” decided to launch a suicide mission under a homemade Turkish flag. Their target: a train of 40 open ore wagons carrying more than 1200 holiday-makers. 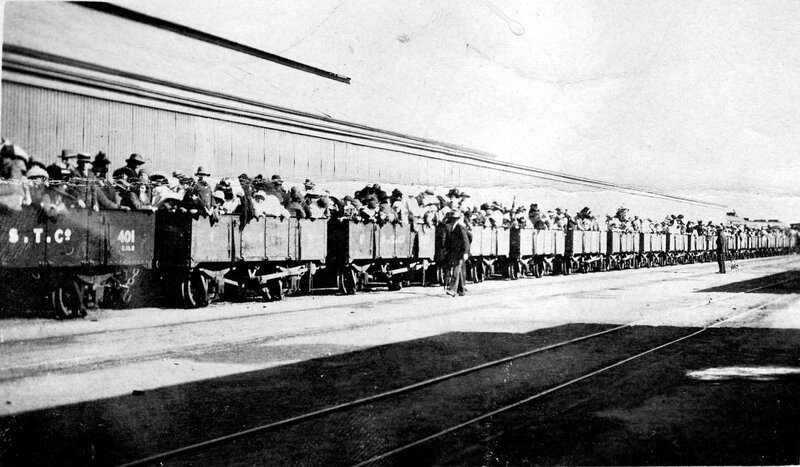 At 10 am on 1 January 1915, the long and crowded train pulled away from the Broken Hill platform. It had been a town ritual since 1901: on New Year’s Day, the Manchester Unity Independent Order of Oddfellows, a friendly society founded to embrace education and social advancement, held a picnic 25 kilometres away at a shady creek in Silverton. The ore wagons were hosed out, wooden planks were set up for passengers to sit on and to pack underneath chairs, blankets and wicker hampers containing lemonade and lamb sandwiches, these to be consumed beneath the gum trees while families watched the running and obstacle races. Dressed in their freshly laundered best summer clothes, some holding parasols, hundreds of lighthearted men, women and children chatted and waved as the train jolted forward and headed out towards the desert. Australia had been at war since August 1914 – many of these picnickers had brothers, fathers and sons in the Commonwealth Expeditionary Force that only weeks before had reached Suez. Yet this was a day to forget absent ones. On that Saturday morning, few places on earth were as peaceful as the red landscape surrounding Broken Hill, or so remote. An ore wagon still marks the spot, 3 kilometres out. Wooden-sided, it looks bigger than in the photos, as if built for cattle. All around, under the widest of blue skies, stretches a flat expanse of stony, treeless desert dotted with wind-twisted, blackened vegetation and the skulls of gourds and paddymelon. Blink, and this might be the Holy Land. Less than ten minutes after leaving the station, the train slowed down, the driver having been warned that sand had drifted across the line. The engine stoker was standing out on the footplate when he noticed a red cloth fluttering above a white cart. His first thought: someone’s exploding defective ammunition. But he dismissed it. No one would be venturing out with a powder magazine on New Year’s Day. The white cart was parked close to the tracks, on the other side of a trench. As the train steamed closer, the stoker read the words painted on the side – “Lakovsky’s Delicious ITALIAN ICE CREAM. A Food fit for Children and Invalids” – and relaxed. “It’s rather late for an ice-cream cart to be going out to Silverton,” he observed. They chugged past. The driver noticed what looked like an insignia on the red cloth. What this was, he couldn’t make out. Then a breeze sprang up, the cloth unfolded, and the driver saw a yellow crescent, like a banana, and a star. At that moment, a pair of white turbans bobbed up from the trench – dark faces, the tips of rifles – and the driver heard two gunshots. One bullet hit the sand, spitting dust against the engine. The second bullet struck the brake van, embedding itself in the woodwork. “It’s the Germans,” joked another. The Germans! In Broken Hill! Everyone laughed. They thought it was a stone pinging against the side. The two turbaned men continued to fire at the train, ducking down after each shot to reload or to take cover in case anyone shot back. But no one shot back. No one had any idea what was going on. Two girls yelled “Happy New Year!” at the spectacle of two dark men in red jackets and frost-white turbans. They imagined the shots were being fired in honour of the passing train. A guard of honour. A stone. Children taking pot shots at rabbits. Each wagonload formed its own interpretation. One passenger, registering two men lying on the embankment above the pipeline trench, assumed that something was wrong with the water pipe – a leak? – and these men were attending to it. Another, seeing a cow on the right-hand side, wondered if some idiot was trying to shoot it. Then a dairyman’s 17-year-old daughter, Alma Priscilla Cowie, standing beside her boyfriend, Clarence O’Brien, slumped to the floor. When O’Brien reached out to hold her, he saw that the back and top of her head had been blown away. The two soldiers of Allah were not Turks, but British passport-holders from India’s north-west frontier, a region now divided between Afghanistan and Pakistan. The younger was the ice-cream seller, Badsha Mahomed Gül, a thoughtful 39-year-old Afridi. Born in the mountainous Tirah region, Gül had come to Australia as a cameleer. When the camel business declined, he had worked in a silver mine until the outbreak of war, and was laid off after all contracts with the German smelters were cancelled. Then, in November, Gül had bought a horse-drawn ice-cream cart from an Italian. Already, he was a familiar figure in Argent Street. Yet Gül’s friendly, open manner with Broken Hill’s children, to whom he sold lollies and buttermilk ice-cream for threepence a scoop, concealed a complicated, anguished character. Three days after the tragedy, a confession was discovered, tucked under a rock and written in a mixture of Urdu and Dari, in which, astoundingly, Gül claimed to have visited Turkey four times – and even to have enlisted in the sultan’s army. He wished he’d still been in Turkey when war broke out, he told his companion-in-arms Mullah Abdullah, apparently over a pipe of hashish in one of the humpies in the North Broken Hill camel camp, where they lived side by side. Reserved, simple, moody, Mullah Abdullah was a disgruntled old cameleer with a limp. Aged 60, he had lived in Broken Hill for 15 years. Different skin colour, strange clothes, not Anglo-Saxon – boys laughed when he hobbled by and chased him down the street, throwing stones. He never retaliated, but several times complained to the police, who failed to act. Ridiculed, Mullah Abdullah immersed himself in his daily prayers. He was not trained as a priest, but he had priests in his family. In the absence of a religious leader, he had begun to take on that role in “Ghantown”, as the North Broken Hill camel camp was known. As well as acting as imam, he served as the butcher of his community, slaughtering animals in the manner stipulated by Islamic law. The fact that he was not a member of the butchers’ union in the most unionist town in the country brought him into conflict with those who needed little excuse to treat a Pathan from north-west India as an enemy alien. The most aggressive of his persecutors was the local sanitary inspector, a short, mournful-looking Irishman called Cornelius Brosnan. Since his arrival in Broken Hill, Mullah Abdullah had slaughtered and prepared his meat in Ghantown, out of sight of the town. He had received no reprimand from the council until the moment of Brosnan’s appointment. Brosnan was overzealous, perhaps because he was not qualified. He had tried twice to get his inspection certificate, and failed. “Why should the council carry Mr Brosnan in its arms?” was one alderman’s opinion. But Mayor BV Brody had got to know Brosnan when he was in charge of the gang laying the wooden water pipe from Silverton, and in 1913 appointed him acting chief sanitary inspector. Brosnan might not have had a certificate, but he was a union man with “a bit of push behind him”. Brosnan set to work, and no one was immune. On discovering the state of the floors in the council toilets, Brosnan installed a penny-in-the-lock slot, and chastised the men and women in the council whose sense of cleanliness, he said, “did not redound to their credit”. Obsessed with proving himself in his war on scarlatina, diphtheria, pneumonia and typhoid, Brosnan became a tyrant against all filth. In order to keep Broken Hill’s premises in conformity with the requirements of the Pure Food Act, he fined a shopkeeper who sold butter that, in Brosnan’s opinion, was “not fit for greasing boots”. He chased a man riding in a suspicious milk cart – “the more he cried whoa! the faster he’d go”, reported the Barrier Truth – and when the cart struck a stone Brosnan stayed only long enough to collect eight samples. The uncertificated ex-pipe-layer was also strenuous in hunting down anyone he suspected of contravening the Broken Hill Abattoirs, Markets, and Cattle Sale-Yards Act. Brosnan prosecuted Mullah Abdullah for the first time in April 1914, for slaughtering sheep at the North Broken Hill camel camp instead of at the abattoirs. In court, the Ghantown butcher read haltingly from a piece of paper: “Me not guilty; not know break law; very sorry; not do again.” Ordered to pay a fine of £1 or go to prison for seven days, Mullah Abdullah paid the fine. The sanitary inspector visited Ghantown again on 4 December and found four sheepskins strung out on the fence. He looked for Mullah Abdullah and beckoned him over. Mercilessly, Brosnan recited the regulation that each butcher’s carcass slaughtered at the abattoirs must be branded with a distinctive brand in indelible red. There was no brand on these carcasses. This time, Mullah Abdullah was fined £3 and ordered to pay the costs of the court. The police magistrate gave him until the end of December to pay, or face imprisonment for one month. Mullah Abdullah felt utterly dejected. He had no means of paying the fine. A fire that broke out while he was boiling some fat had destroyed his uninsured two-room house and his possessions, including all the money he had. He had lost everything. Brosnan’s strict application of a set of regulations that made no sense to him and contravened his religious principles now threatened his freedom. Back in Ghantown, he wallowed in an apathy from which no one could stir him, save Gül. One day the inspector accused me. On another I begged and prayed, but he would not listen to me. I was sitting brooding in anger. Just then the man Gül Mahomed came to me and we made our grievances known to each other. I rejoiced and gladly fell in with his plans and asked God that I might die an easy death for my faith. Gül did not need to remind Mullah Abdullah that Turkey was at war with Australia, and that the sultan, only three weeks earlier, had appealed for a jihad against the Entente powers, obliging all Muslims young and old, on foot or mounted, to support it. Rather than go on living this persecuted and insulting existence in Broken Hill, wouldn’t it be better to die gloriously with the guarantee of happiness in the next life – by killing as many Australians as they could? The Australians were doing all these terrible things to true believers, not only here but also in Egypt and no doubt imminently in Turkey. So why not go for them? Early on 1 January 1915, the two-man army packed into an ice chest a Snider-Enfield, which Gül had bought for £5, and a Martini-Henry breech-loader with a long steel barrel. Then they climbed onto Gül’s ice-cream cart and rode out of Ghantown, following the railway line towards Silverton, to declare war on Australia. 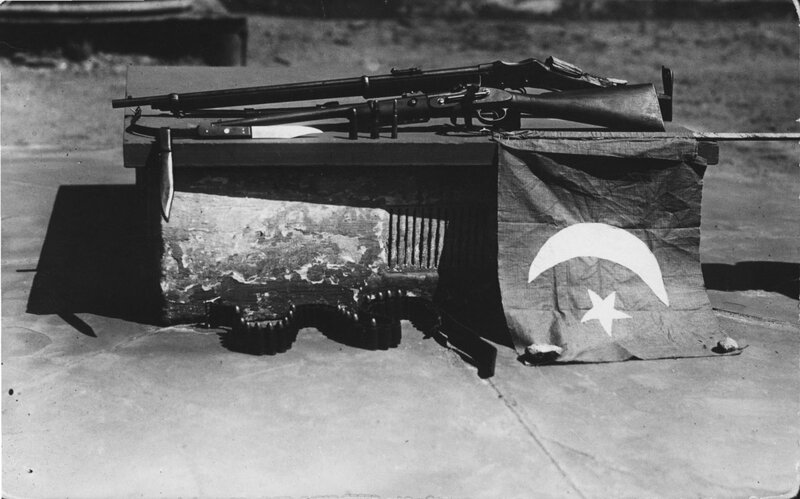 The weapons and flag of Abdullah and Gül. Image courtesy of the Broken Hill archives. In white shirts and hats, peering over the side, in the scorching sun, were all those unbelievers, waiting to be picked off. The plan was that the engine, unmanned following the attack, would drag the 40 packed ore wagons to destruction. In the event, the jihadists missed not only the driver and the stoker but also Mullah Abdullah’s particular bugbear, Cornelius Brosnan – “owing to my grudge against the inspector it was my intention to kill him first”. Even so, three of their bullets killed Alma Cowie; William Shaw, from the sanitary department; and Alf Millard, who had ridden up on his motorcycle, clutching the camera with which he intended to photograph the picnic. Once the train had steamed out of sight, the two men walked back towards town, taking shelter on a rise behind an outcrop of white quartz boulders. Here, beneath their red flag, they held out for the next two hours. As word of the attack spread, they were encircled on the granite slopes below by an enraged posse that comprised, eventually, 53 troops from the 82nd Infantry Battalion, ten policemen, members of the Volunteer Rifles – and basically “anyone with a gun who wanted to have a lash”, according to a man I met in the Broken Hill library whose grandfather was on the train. This was a militia, in the words of a local reporter, “desperate in its determination to leave no work for the hangman”. I follow a road to the white rocks. Local hoons doing wheelies have left dark skid marks on the tarmac. Waves of heat dance off the slopes. It’s a desolate place, despite the incongruous presence of a ghost-white replica of what is billed, optimistically, as “perhaps the most famous ice-cream cart in the world”. Just before 1 pm, an armed mob surged to the top of the hill to inspect the two bodies that lay ten metres apart. Mullah Abdullah had been shot through the temple. Gül had 16 bullet wounds and was still breathing – he died shortly after in hospital. From start to finish, the Battle of Broken Hill had lasted three hours, leaving six dead (the sixth was Jim Craig, hit by a stray bullet as he chopped wood in his backyard) and seven injured, including a 23-year-old tailoress who had been hit by a fragment of bone from Alma Cowie’s skull. The following night, police prevented a lynch mob from attacking Broken Hill’s Muslim population. Instead, the mob burnt down the local German Club, seeing the tragedy as the fault of “enemy aliens” more generally. We are pleased to report the success of our arms at Broken Hill, a seaport town on the west coast of Australia. A party of troops fired on Australian troops being transported to the front by rail. The enemy lost 40 killed and 70 injured. The total loss of Turks was 2 dead. The capture of Broken Hill leads the way to Canberra, the strongly fortified capital of Australia. Shortly afterwards, on a beach on the other side of the world, a force of 20,000 Anzacs, many with the 3rd Brigade that included miners from Broken Hill, landed on the Gallipoli peninsula. No one in Broken Hill knows where Gül and Mullah Abdullah lie buried, as if this strange and tragic event had been blown away by the desert winds. Yet it would be a mistake to disregard their narrative, the bones of which keep reassembling – resurrected by the same combination of frustration, racial and religious discrimination, ignorance – and then exploding. By strange coincidence, I return to the Palace Hotel as news breaks of a manhunt in Boston for two Chechen brothers. Motivated by extremist Islamic beliefs, the young men had launched an attack on the Boston Marathon, killing three and injuring 264. Their bombs: two pressure cookers. Back in England a month later, I watch the television news. In Woolwich in south-east London, two British men of Nigerian descent have hacked a soldier to death to avenge the killing of Muslims by British armed forces. In September this year, the Australian government and police step up anti-terrorism measures following the rise of Islamic State in Iraq and Syria. In the Melbourne suburb of Endeavour Hills, 18-year-old Abdul Numan Haider, summoned for a police interview, is shot dead after allegedly stabbing two officers. It may be a hundred years old, but the narrative that played out in the Australian outback in 1915 touches all of us – wherever, and whoever, we are. Nicholas Shakespeare’s novella based on the Broken Hill massacre, Oddfellows, will be published by Random House in January.